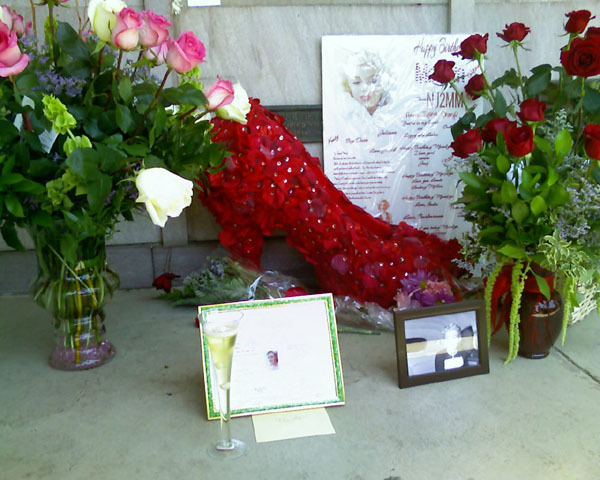 For Marilyn’s 82nd birthday the NJ2MM / Norma2Marilyn Fan Club, of which I am the president, decided to give a really unique floral bouquet to Marilyn at her final resting place in Westwood Cemetery in Los Angeles. 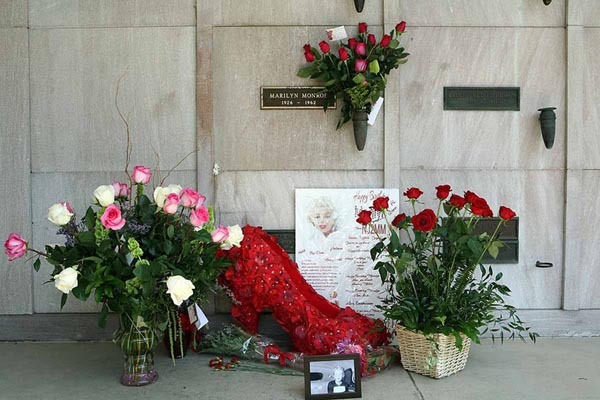 After getting some input from our members, we decided on an idea which was suggested by our member Irene – which was to make a red rose bouquet in the shape of Marilyn’s red stiletto shoes. We are very greatful to an anonymous sponsor, a member of our group, who underwrote the cost of making this idea come true! 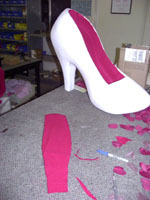 To begin with, we arranged for an artist, Eddie Wright, to carve a huge styrofoam sculpture of the red stiletto based on photos of Marilyn’s stilettos which sold in the Christie’s auction of 2000. Eddie did a really fine job for us and we recommend him for anyone needing any kind of styrofoam sculptures or creations. Click on the banner link below to check out his website and see examples of what he can do. 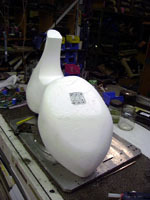 His fee was very reasonable and he worked promptly to get the sculpture to us within a few days. 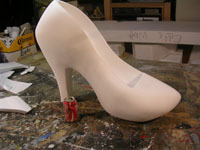 The foam sculpture of the stiletto was sent to us for decoration. It looked like this when we got it. 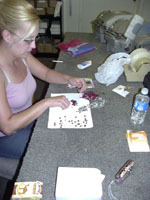 Our idea was to cover it with red silk rose petals and sequins attached by hot glue. So we got 800 rose petals, 1000 red and silver sequins, a bunch of straight pins, and some red felt, and got to work on the project. 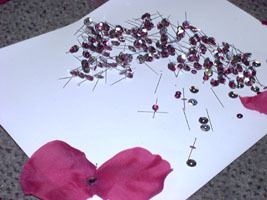 My girlfriend, Beth, who is the VP of Norma2Marilyn, started putting the sequins and rose petals together, and I began by cutting out and gluing red felt in place to make the inside lining and sole. I also hollowed out a space in the sole of the sculpture and glued a steel plate into it – to give it some weight so it wouldn’t blow away in the breeze at Westwood. 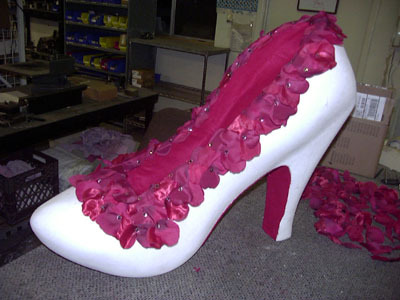 Then we started attaching the petals to the foam sculpture, using a hot glue gun. Beth also made a beautiful card with birthday messages and comments from our members to Marilyn on her birthday. 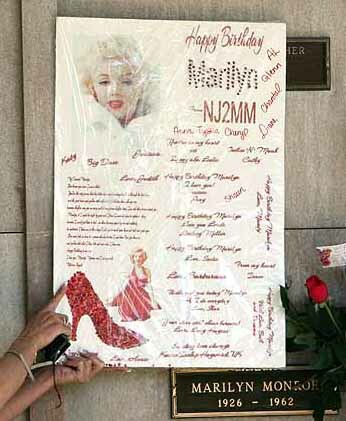 She used the sequins to form Marilyn’s name and the red stiletto picture on the card. Since the bouquet was made of duarable materials which will last for years, and since we knew from previous experience that anything left for Marilyn at her grave soon ends up either in the trash or else gets taken by someone, we decided to award the bouquet to Irene as a prize for her suggesting the idea of the stiletto bouquet in the first place. UNKNOWN- instead of suicide, or accidental overdose ?